The entry-level occupational therapy doctoral degree (OTD) programs at the Austin, TX and San Marcos, CA campuses are accredited by the Accreditation Council for Occupational Therapy Education (ACOTE) of the American Occupational Therapy Association (AOTA), located at 4720 Montgomery Lane, Suite 200, Bethesda, MD 20814-3449. ACOTE’s telephone number c/o AOTA is (301) 652-AOTA and its Web address is www.acoteonline.org. Graduates of the programs will be eligible to sit for the national certification examination for the occupational therapist administered by the National Board for Certification in Occupational Therapy (NBCOT). After successful completion of this exam, the individual will be an Occupational Therapist, Registered (OTR). In addition, all states require licensure in order to practice; however, state licenses are usually based on the results of the NBCOT Certification Examination. Note that a felony conviction may affect a graduate’s ability to sit for the NBCOT certification examination or attain state licensure. The entry-level OTD programs at the St. Augustine, FL, Miami, FL and Dallas, TX campuses have applied for accreditation and have been granted Candidacy Status by the Accreditation Council for Occupational Therapy Education (ACOTE) of the American Occupational Therapy Association (AOTA), located at 4720 Montgomery Lane, Suite 200, Bethesda, MD 20814-3449. ACOTE’s telephone number c/o AOTA is (301) 652-AOTA and its Web address is www.acoteonline.org. The programs must have a preaccreditation review, complete an on-site evaluation, and be granted Accreditation Status before its graduates will be eligible to sit for the national certification examination for the occupational therapist administered by the National Board for Certification in Occupational Therapy (NBCOT). After successful completion of this exam, the individual will be an Occupational Therapist, Registered (OTR). In addition, all states require licensure in order to practice; however, state licenses are usually based on the results of the NBCOT Certification Examination. Note that a felony conviction may affect a graduate’s ability to sit for the NBCOT certification examination or attain state licensure. The University of St. Augustine for Health Sciences currently is accepting applications for enrollment in the Flex Doctor of Occupational Therapy for residents of the following states: Alaska, Alabama, Arizona, California, Colorado, Connecticut, Delaware, Florida, Hawaii, Idaho, Indiana, Illinois, Kansas, Louisiana, Massachusetts, Maryland, Maine, Michigan, Minnesota, Mississippi, Missouri, Montana, North Dakota, Nebraska, New Hampshire, New Jersey, New Mexico, Nevada, Oklahoma, Pennsylvania, Rhode Island, South Carolina, South Dakota, Texas, Utah, Virginia, Vermont, West Virginia, Wyoming. 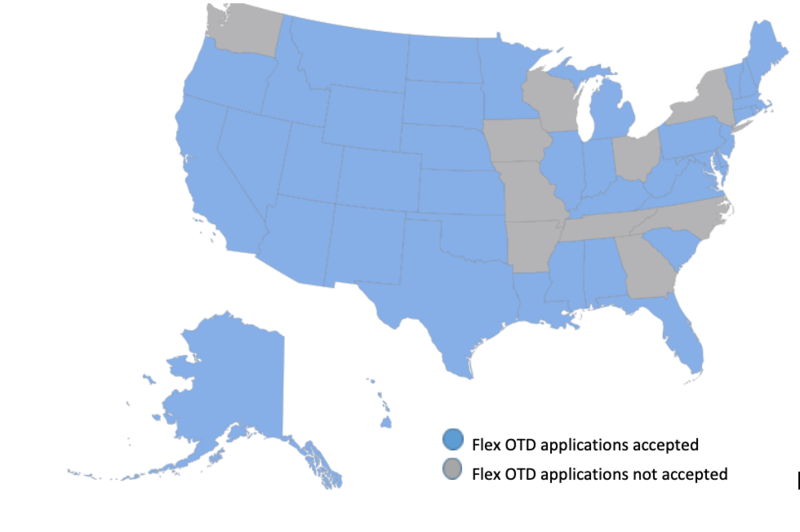 The map below identifies the states from which the University is now accepting applications for the Flex OTD program (indicated in blue).